This fully fortified meal replacement has only 100 calories and 15 grams of protein making it perfect for anytime of day. 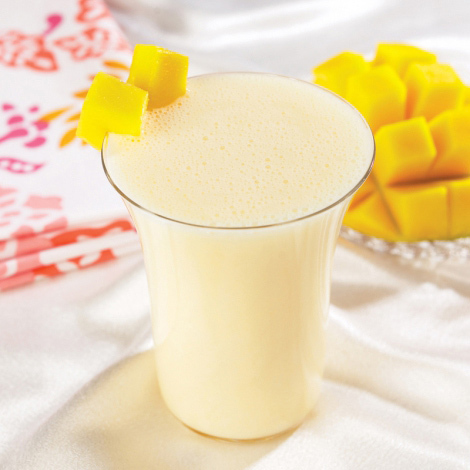 Bari Life Aloha Mango Protein Smoothie Packets are delicious, easy and effective when used as part of a well designed weight loss plan. Calcium Caseinate, Whey Protein Concentrate, Non Fat Milk, Natural and Artificial Flavors, Mango Powder, Fructose, Food Starch Modified Gum Arabic, Xanthan Gum, Guar Gum, Sunflower Oil, Maltodextrin, Sodium Caseinate, Salt, Malic Acid, Mono and Diglycerides, Natural Tocopherols, Sucralose, FD&C Yellow5, Silicone Dioxide and/ or Tricalcium Phosphate, Acesulfame Potassium, FD&C Yellow6. For thicker and creamier smoothie try using skim milk or unsweetened almond milk instead of water. Add fresh or frozen fruits, such as, bananas, mangos and strawberries to provide you with an even more filling smoothie that is still healthy. Really like the mango flavor and smooth texture. I use a shaker bottle and found that it mixes better adding the mix to the water rather than the other way around. This flavor reminds me of a tropical drink. It is very sweet like all tropical drinks. It’s not a daily go to, but perfect when you are craving something different. This protein drink is wonderful! I use it in a blender bottle with a little ice and it shakes up smooth and yummy! Great flavor! Great texture. This smoothie is one of my favorites for between-meals yumminess. I love the mango shake! I feel like I’m eating fruit. This is fabulous! This is really different, but I like it. The protein, carbs, fat ratio is great.